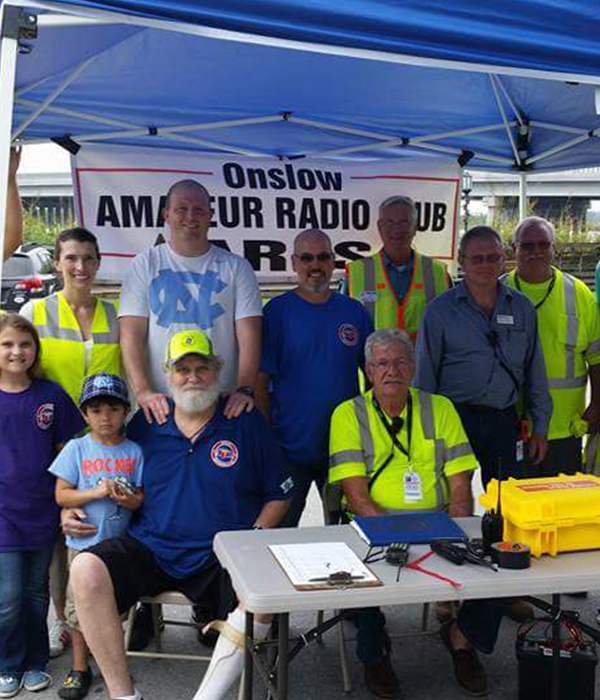 The Onslow Amateur Radio Club, Inc. The Onslow Amateur Radio Club, Inc. (OARC) was incorporated on March 4, 1969 by a group of "Hams" who realized the need for a social and hobby agenda for the betterment of both the "hobby" of amateur radio and the social functions which it brought together. About a day or so later the Articles of Incorporation for the Onslow Amateur Radio Club, Inc. were posted as a matter of record in the Registrar of Deeds office of Onslow County. Some thirty years later the OARC is still viable and active. During the past years the members of the OARC have participated in different activities. To list just a few: the annual ARRL Field Day in June; Armed Forces Day; and the Kinston Hamfest, held during March of every year for the last 13 years. Club members have worked and held committee positions on the Board of Directors for the Maysville Hamfest in October of each year. Many such members are the ones who are available at their own stations each night of the week to handle health and welfare messages for the area, which makes them prepared to handle emergency traffic during an emergency of any type. Some of us just like to sit back and work a DX station or two on a quiet summer evening. There are those whose dream is to be the station on the air that caught that one elusive station on six meters. Other aspects of the Amateur service are enjoyable. There were the times we used our radio equipment with the local police department to extend their "eyes and ears" in the Halloween Trick or Treat Watch; the different times when the area Hams set up the special event stations from beautiful Pumpkin Center, North Carolina; or the drives and caravans we took to Turkey, North Carolina to set up and operate the special event "Turkey Talk" station for Thanksgiving. Amateur radio is not just a hobby, this is a service. The licenses we hold are a privilege granted to us by the FCC. These licenses carry some responsibilities; we have the responsibility of providing emergency communications in the event of a disaster. All of the training we do, from participating in a formal traffic net to setting up a special event station, makes us better communicators. The Hamfests, ragchew nets, and monthly meetings improve the camaraderie we enjoy as Hams. Our expertise in communications, whatever the type of communication you desire to use, are our contribution of service to the public. In times of emergencies, both national and local, the communications effort and expertise of Amateur Radio has been challenged--and that effort and expertise has allowed Amateur Radio to meet the challenge. Would you like to be a part of this effort? Take a break from the regular routine and come join the club for a good old "rag chew" meeting. Meetings happen the second Tuesday of each quarter and begin at 7:00 pm, in the Onslow County Emergency Operations Center (EOC).